Romance writer Mona Rossi's book sales are slipping. She needs new ideas and fast! 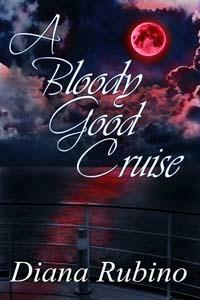 Her vampire love, Fausto Silvius is a doctor aboard the Romanza, a luxury cruise ship. Holding a "Motion on the Ocean" writer's cruise sounds like a great idea. What better way to combine a career boost with romance? But they soon discover hunters on board who give chase to Fausto and his fellow vampires. While he longs to bring Mona into his world, how can he convince her to join him with fringe lunatics on the hunt? In the prime of her life she's not sticking her neck out for a shot at eternity. What do you most want out of life, and what’s its opposite? I most want social acceptance and its opposite is to disappear in the crowd, to be an ordinary citizen. What are your wildest dreams/fantasies/kinks/quirks? My wildest dream is to live a week in Ancient Rome, as a Senator’s mistress. If you have 2 hours free time tonight, what would you rather do? Why? aromas of notes of leather and cherry. Upon sipping, you get an astringent taste. Being turned—but it was a matter of life and death. I trusted Fausto with my life, and here I am. 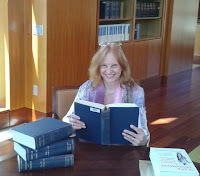 My passion for history and travel has taken me to every locale of my stories, set in Medieval and Renaissance England, Egypt, the Mediterranean, colonial Virginia, New England, and New York. My urban fantasy romance, FAKIN IT, won a Top Pick award from Romantic Times. I’m a member of Romance Writers of America, the Richard III Society and the Aaron Burr Association. I live on Cape Cod with my husband Chris. In my spare time, I bicycle, golf, play my piano and devour books of any genre. Visit me at www.dianarubino.com, www.DianaRubinoAuthor.blogspot.com, https://www.facebook.com/DianaRubinoAuthor, and on Twitter @DianaLRubino. Love the cover and the idea behind this book. I enjoyed the excerpt too. MY TBR list keeps growing. Thank you, Daisy, for checking our tour! The great part is that it is a direct exchange. I post her book and she posts mine. This way, Shadows of the Past s all over. Thanks, Daisy, and thanks, Carmen, it looks awesome! You're on my blog today too! Best of luck with finding new fans! What a cool concept for a story! Fausto sounds like he has a complex background, too. Love the cover and enjoyed the excerpt. I'm intrigued! I am totally with you, Mae. Great cover and premise of the story. I have added this to my TBR list and look forward to reading it. The author's passions for history are what sold me, along with the feeling the excerpt gives of course. Love the title and the bloody moon. Great wildest dream!